It used to be that catching Little Steven and the Disciples in concert was a truly rare occasion. The Rock and Roll Hall of Fame inductee and longtime member of Bruce Springsteen’s E Street Band was the first to admit from the stage on May 15, 2018 at the beautiful CMA Theater in Nashville that he took the past 20 years off to screw around playing a gangster on The Sopranos. 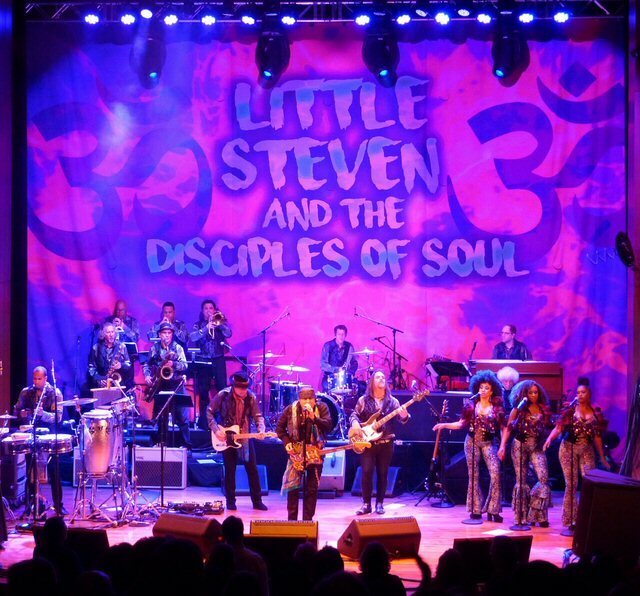 Little Steven and the Disciples of Soul roll into Music City. Now, in what looks to be an attempt to make up for lost time Steven has reformed his Disciples and he’s seeking followers to join him as he rebuilds his neglected brand. 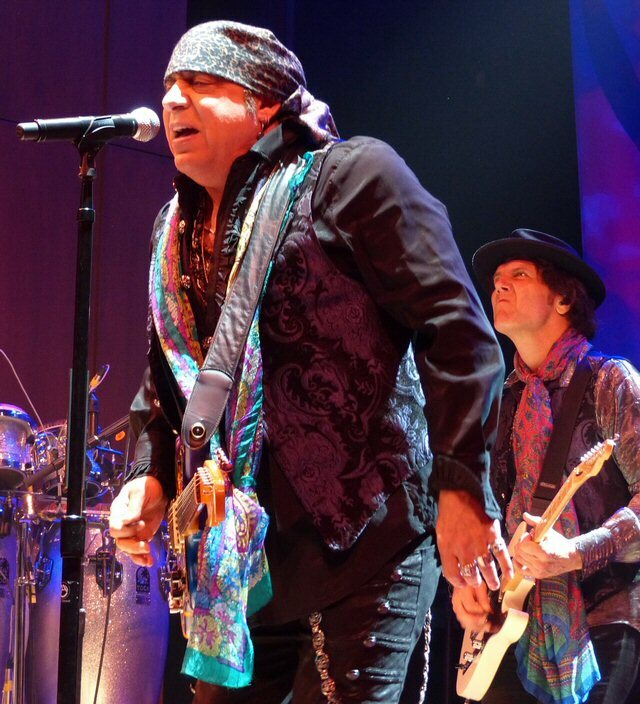 It was back in 2017 that the artist once known as “Miami” Steve Van Zandt released a new album called Soulfire. He soon took that project out on the road with a very large band in tow. Now, exactly one year later, that trek is documented on Soulfire Live! – an expansive 24-song set available now at all digital music retailers and streaming services with physical 3-CD, Blu-ray, and vinyl editions arriving this summer. While Steven is probably best known for the star-studded “Sun City” single that he composed and produced as a protest against Apartheid in South Africa that song is curiously left off the collection. What’s there are several tracks he wrote during his time with Southside Johnny, satisfying covers and select material from his own albums. The new record also features a version of his modern day anthem “I Am a Patriot” that has been recorded by everyone from Jackson Browne to Eddie Vedder over the years. At the CMA Steven was revealing what he called a Broadway style show even as his Boss is mining the Great White Way for gold and critical acclaim. In this setting Little Steven served as emcee and educator in a presentation that really was an extension of his other day jobs that include stints as a radio host and channel programmer on Sirius Satellite Radio. In this capacity he enlightened the audience on the songs that had a big impact on him through the decades. 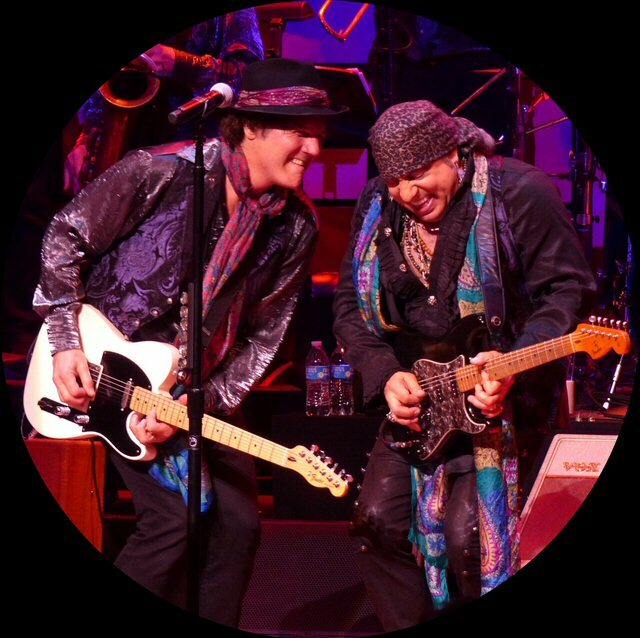 Rock Hall of Famer Little Steven plays the C.M.H.O.F. Highlights from this portion of the set included “The Blues Is My Business” by Etta James, “Saint Valentine’s Day” from the Cocktail Slippers and the extended “Down and Out in New York City” by James Brown which found Steven joyously trading licks with bandmate Marc Ribler. Van Zandt could be vying for the title of the hardest working man in show business. On Tuesday, he put two and a half energetic hours into his concert while the night before he was spinning records at downtown’s Hard Rock Café. But, that’s not all the bandanna adorned artist has been up to. 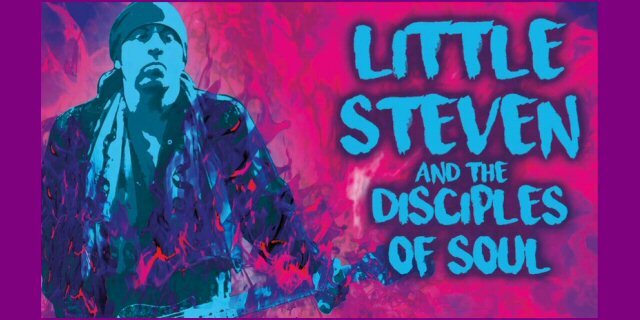 This current run of dates has been dubbed by Little Steven and the Disciples of Soul as the Teacher Appreciation Tour. Local educators who sign up for free professional development sessions held before each concert will receive a complimentary ticket to that evening’s show and the CMA Theater was near capacity even though it was still a school night as summer break nears in Nashville. This leg of the tour in turn is helping spread the word about The Rock and Roll Forever Foundation – a 501(c)(3) established by Steven Van Zandt. TeachRock is the Foundation’s national middle and high school curriculum initiative that was created to address the challenges of an environment in which schools face cuts to arts spending. Since funding for actual instruments is currently prohibitive Steven is focusing on teaching music history directly through classrooms and participating educators. By compiling lessons plans, videos and thematically appropriate documentaries that are up to the task of teaching the importance of music history Van Zandt has moved to the head of the class in Rock and Roll High School as far as we’re concerned. Marc Ribler and Little Steven at the CMA Theater. Steven was an entertaining and informative frontman with a fabulous band and a wide swath of material to mine – including, seemingly the whole history of rock, blues and soul. He has surrounded himself with a talented and versatile team. Out front Van Zandt was most convincing when he put out the call for unity in the face of our current turbulent times. Maybe that’s a skill he picked up from B.S. along the way. One lesson he’s definitely learned is that the guitarist, actor and radio host plans to make the comeback last this time around. Nestled in the heart of Music City, the state-of-the-art, 776-seat CMA Theater is a unique circular venue for live performances. The CMA Theater was built with its audience in mind, to ensure that each seat feels like a “front row” experience. You can experience what’s fast becoming one of the city’s best loved rooms when An Evening with Beth Hart (Sept. 21, 2018) and Rufus Wainwright (Dec. 11, 2018) take the stage. 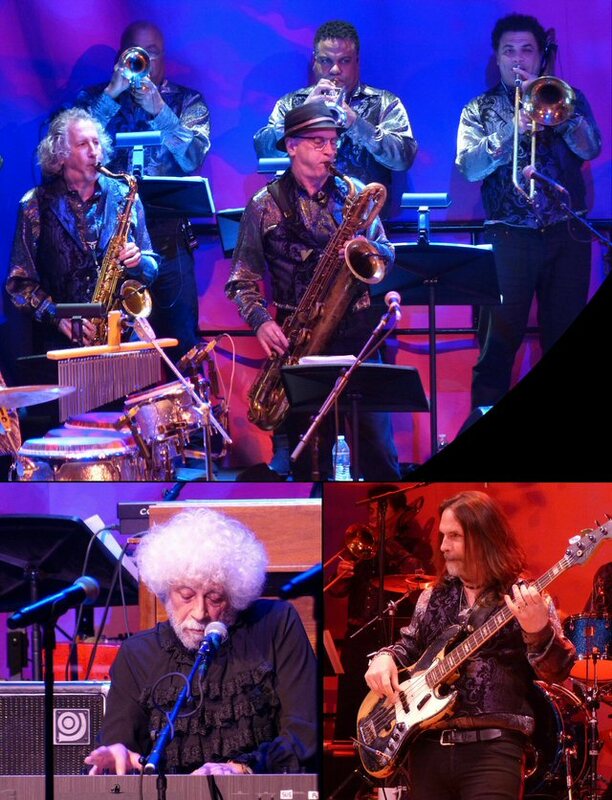 More scenes from Little Steven and the Disciples of Soul.